Previous Project | Vietnam | DARE Association, Inc.
Background: Micro-philanthropy captures the pent-up enthusiasm of many people who wish to do good in the world by making relatively small donations, solicited through internet communications or “crowd funding.” Micro-Philanthropy is loosely inspired by the work of Mohammed Yannus in the development of the Grameen Bank in Bangladesh. Just as Grameen Bank established that it was not necessary follow the procedures of, or be, the World Bank or Bank of America to make micro loans, without collateral, to impoverished people, so too we have established that it is not necessary to be the Bill and Melinda Gates Foundation or the Ford Foundation to make meaningful contributions to poor, disadvantaged developing country individuals and institutions. Integration of Resources: Program activities Integrate Dare Association unpaid staff, volunteers, governmental, and non-governmental personnel, as well as donors. Determination of needs: In determining needs, the perspective of all participants is considered. Assistance tends to be focused on pressing priority needs as specified by the leaders of the institutions (or direct recipients of aid). Time-Frames: All time frames are considered appropriate for activities – immediate, short-term, intermediate-term, and longer-term needs. Data Collection: Opinions and insights on needs and appropriate activities are integrated from all participants, or on observations and research on longer term priority needs conducted by program staff and volunteers. Relationships: Trusting relationships and long- term commitments are essential -- Trust that Dare staff will honor all commitments and will return yearly or more often, as well as trust that Haiphong personnel and institutions are going to collect and communicate information on needs accurately, and not seek personal financial benefits. (Pro bono staff from Dare Association pay their own travel, hotel and food and other non-program expenses). Control of Funds: Despite the trusting relationships, only in rare exceptions, are funds disbursed to anyone. Rather, the Dare representative handles all funds and personally makes all purchases with assistance as required. This protects the program and personnel from criticism. Transparency: Dare staff is open with collaborators about the extent of funds available, and provide them and supporters, a report of each day’s activities and purchases, including photos (to help bring the experiences to life for managers and donors). History: In 2010, Dare Association’s Director of International Programs (staff) was serving as the Acting HIV/AIDS Prevention Advisor at the United States Agency for International Development Office in Hanoi, Vietnam. 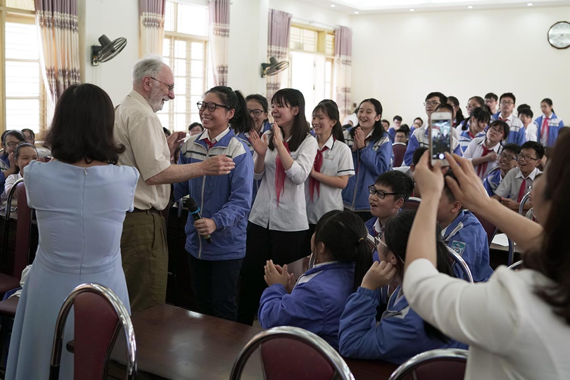 The USAID Director of Health requested him to join a team of Vietnamese staff traveling to Haiphong to provide the Haiphong Peoples Committee a presentation on “Best Practices for Supporting Orphaned Children.” At the conclusion of the presentation, the Vice Chair of the Haiphong People’s Committee invited him to tour two orphanages – Red Flower Children’s Village, and Thanh Xuan, an orphanage for HIV+ children (which was under construction at the time). Red Flower operated on the SOS model developed in Europe. Rather than a large building housing all the children, the SOS model had 7-8 houses on a campus. Each house, inhabited by 7-9 children, had a “mother” and “antie-helpers.” At the time, staff noticed that the children evidenced none of the symptoms of institutionally raised orphans. They seemed relatively outgoing and reasonably confident in contrast to those raised, for example in Eastern Europe. However informally he noticed that there was very little of the materials that help make childhood a rich experience – books, toys, sporting equipment, art supplies, etc. Staff described these observations to a close friend who advised him to prepare a proposal for her brother’s family foundation and request $5,000 to help with these issues. The proposal was funded and the funds were managed by the Public Health Institute in Oakland, California. 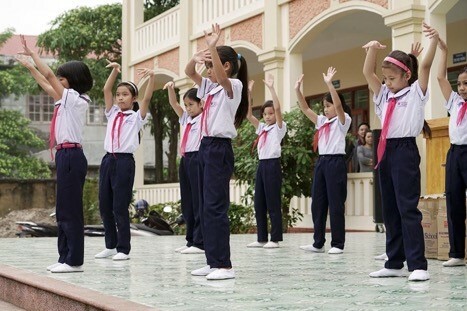 Expanding the Experience: The Vice Chair of the Haiphong Peoples Committee responded to this experience by suggesting other agencies which could benefit from such assistance. 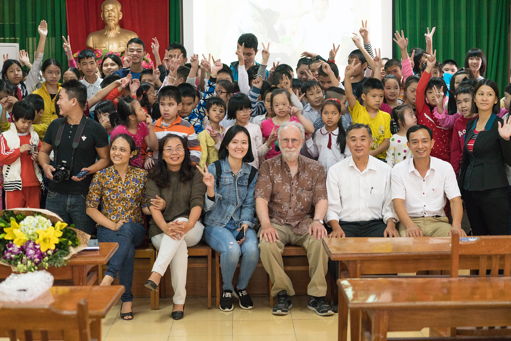 Ultimately this included HHCSC (an organization supporting very poor grandparents raising their orphaned grandchildren), Haiphong’s School for Children with Visual Impairments, and Thanh Xuan Orphanage for HIV+ children (now functioning) and local schools in poor areas. 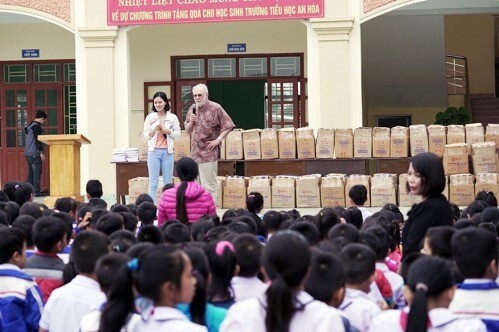 The Vice Director also requested that the Department of Foreign Affairs of Haiphong City provide collaborative assistance for these activities. Aaron Miller, a photographer and videographer arrived today. We picked up Aaron at the airport and drove straight to the Level Hotel in Haiphong and had lunch. After a little rest and Aaron’s shower Ms. Dzung, Deputy Director of the Department of Foreign Affairs for Haiphong City and Ms. Yen, a staff member arrived at the hotel. We discussed Red Flower. Staff had agreed to buy the young man who is enrolled at the University of Haiphong, Qui, an electric motorbike so he could live at Red Flower and commute to the University. This plan seemed to provide a good role model for the rest of the Red Flower children. There was a bike with range of 90 Km for about 10 million Dong ($440 approx). Qui was clear that he lacked enthusiasm for the electric bike. He really wanted a motorbike (gasoline powered). We looked at a 50CC, electric start motorbike for about $550. Qui said he was really happy, he promised not to drive fast and always to wear his helmet, which was included. We made the purchase. We arrived as the children were on a physical exercise break from classes. Music was blaring. Exercises seemed to contain kung fu moves. Many were “marching to a different drummer.” Aaron thought he shot good footage, including slow motion for added drama. 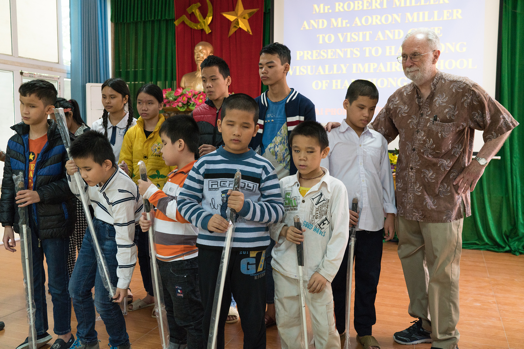 At the conclusion of the exercise period, the kids gathered in the auditorium, while Ms. Dzung, (our close collaborator from the Foreign Assistance Division of Haiphong City) briefed staff on how the presentation of the navigation canes, which staff had obtained in the US, should be choreographed. Staff explained how many of the canes were donated by the American Federation for the Blind and others were purchased from them at a substantial discount. Staff entered the auditorium to the cheers of the children. Navigation canes received from the American Federation for the Blind were in a sealed box and were kept sealed for transport to Vietnam. At the director’s suggestion, staff opened the boxes to the cheers of the children. Staff explained that they had carried them a long way, from the US to Vietnam, and that staff’s only wish is that the canes would help some children and that the children would take care of them. Photos were taken. Then we passed out a mountain of fun packs of M&Ms which the kids loved. There was a lovely song from a chorus of talented children and the gift of huge, beautiful bouquets. 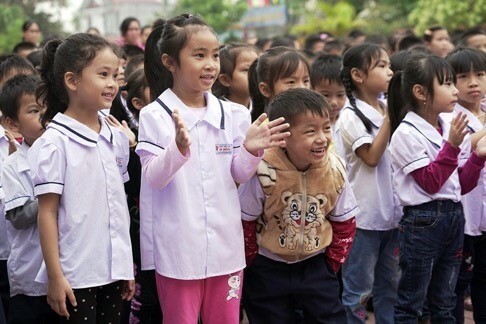 The school for visually impaired children has 110 students. About 40 of them are boarding students. The school has a special room for kids who are ill. The school requested Dare to supply a two-way air conditioner. It will cool the room in the horribly hot summer and warm it in the winter. Clearly this will alleviate suffering for sick kids. After the morning program at the school, staff went to purchase the air conditioner. The first big store was sold out of one with our specifications. The second store had one we wanted: Daikin (made in Japan) two way (both cooling and heating) 18,000 BTU on sale for 24,600,000 VND (reduced from 27 M). After we made our pitch that this is for charity and an opportunity for the store to make a social contribution, we settled at 23M ($1,011) including installation. The Director celebrated the day by inviting Dare staff and Ms. Yen, who did a terrific job as translator, to the most delicious meal of our visit. 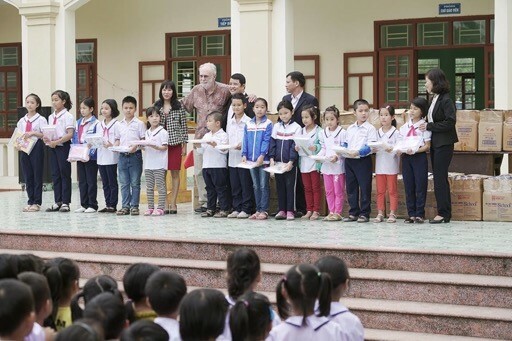 The day was devoted to Thanh Xuan, the orphanage for HIV+ children. The visit started with greetings, hugs, and songs from a talented duet, followed by the distribution of handfuls of mini-Hershey bars. 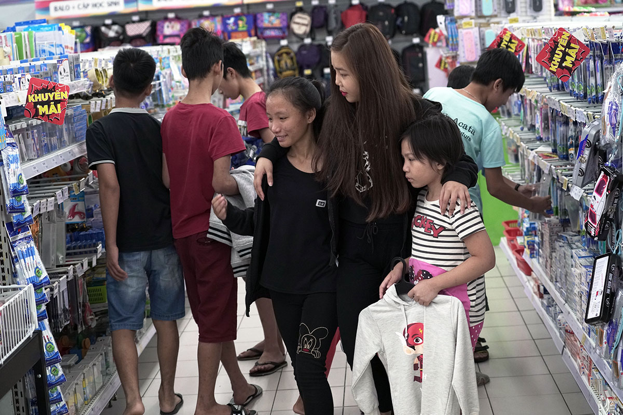 Staff then packed 25 of the 30 kids and 3 staff off to the big department store – “Big C.” Each child was given a budget of 460,000 VND (about $20) and told they could spend 400,000 on clothes of their choice and 60,000 on books or educational supplies. To understand the excitement generated you would need to know that this is a rare occasion for these kids. They are used to the staff selecting or to receiving donated clothes. It took a long time to check out as each article, even socks that cost only 75 cents a pair were fixed with a security measure which had to be removed. Ms. Yen stood by the checkout person seeing that each kid’s selections fit within the allocated budget. The kids made many reasonable decisions, buying sweatshirts, and sweaters, attractive shoes, even a couple of bras. A few of the boys spent their whole budget on special jeans, with patches and rips, high fashion of the day. Although some of those purchases seemed a little questionable (outlandish? ), we did not change the rules or criticize anyone’s selections. (Guided by the same philosophy that led to the purchase of the gasoline rather than the electric motorbike.) The entire occasion was filled with joy! The orphanage has three new babies. Staff bought nine large cans of infant formula and many diapers but had forgotten to buy wet wipes. Staff also bought rain jackets and umbrellas in addition to the clothes the children chose. After the “Big C”, everyone went back to Thanh Xuan for a lunch of spring rolls, noodles and meat stew. After lunch, a delegation went to purchase the items requested by the orphanage. 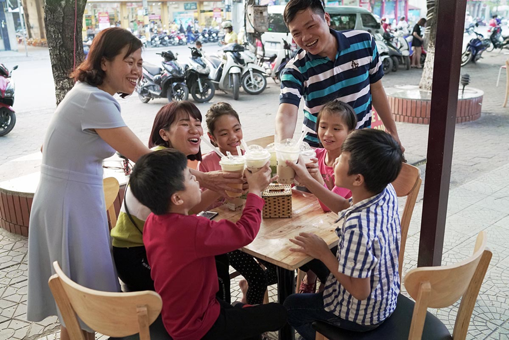 Two years ago, we had purchased the sets of tables and chairs for Thanh Xuan’s dining room. Now staff requested two large air conditioners for that room. 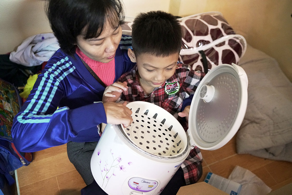 Unclear about pricing or the overall trip budget, only one big air conditioner was purchase today – a 42,000 BTU, large model that cost VND 27,500,000 ($1,200) and a large water filter which produces 10 liters of clean water per day (4,950,000 -- $218). 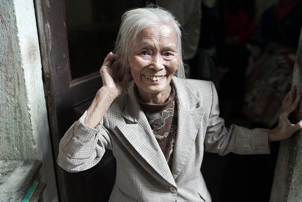 The day began with retrieving $3000 in donated funds staff’s spouse sent to Vietcom Bank. Next door to the bank we purchsed 10 rice cookers to be given to very poor grandparents raising their orphaned grandchildren. Staff next traveled to the supplier of blankets. Heavy, thick fleece, blankets with a velvet type cloth on the other side were selected and. 130 of these were purchased to be delivered and distributed this afternoon. Staff took three blankets and one rice cooker and went to visit two recipients. We drove down crowded back streets and then walked up a narrow lane filled with sellers of every type of meat, vegetables and fruit. We stopped and walked between a vegetable and meat seller to enter the tiny house – one room, about 5’ by 15’, occupied by an aged couple and their grandson age 7. 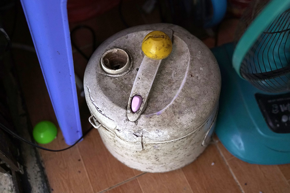 Their electric rice cooker looked ancient and abused. There was a hole in the top covered with half an orange. The grandparents were overjoyed with our offerings. Their grandson was home. We opened a bag of M&Ms, poured some in a dish and handed it to him, encouraging him to try one. The candy, which he had never seen before frightened him. It was only after Ms. Hue cradled him in her arms and told him it was good did he try one. He was convinced! We then went to another dwelling. It was a garage. The 4’7” grandmother was beautiful and expressive. Though only 75, she looked 95. These grandparents were raising two grandchildren. One was severely mentally disturbed, jumping and screaming on the sleeping platform during our entire visit. The woman explained that life was very difficult. She was so effusive in her appreciation for the two blankets we brought – one for the children and one for the couple – and so expressive about her difficulty in raising the children, that I was moved to ask Ms. Yen if it would be OK for me to make a donation of some cash. Ms. Yen said: “It is up to you” so I pulled out one of my 500,000 VND notes (about $22) and handed it to her. Tears of joy flowed down her cheeks. I bent down and kissed her cheek. Her grin became cavernous as she commented on how handsome Aaron is. We went for lunch at the busiest restaurant in Haiphong, and then back to our hotel while the blankets and rice cookers were being delivered. We returned to HHCSC to find the first wave of about 40 aged grandmothers and a few grandfathers ready to receive their bounty. First, a few speeches. Ms. Twi , the HHCSC Director, introduced staff to thunderous applause. Staff spoke about becoming a grandfather and knowing it can be hard but wanted to make life a little easier for them. The old folks were wished “warm winter nights and hot rice.” An old woman then came forward to speak. She said she had two grandsons, age 7 and 5. Their parents died. They come here often to learn computers (which were purchased on the last trip) and study. They love it and could be here all day. She is very happy they have this opportunity. Then each recipient received their goods while many pictures were taken. The old rice cooker and the new one being demonstrated my Ms. Hue. Wonderful grandmother who shed tears of joy. Rice cookers in front; blankets behind. We were entertained by two groups of dancers, both so cute! Kids clapped in time to the dance music. They seemed to appreciate it as much as we did. We arranged for the delivery of educational supplies for each Student – 10 notebooks, a fountain pen, two pencils, a ruler and a plastic case to hold everything. The cost was about $3/student. I am being introduced for a speech. I tell the kids I smiled so much from the dancing that my face hurt. I also tell them to study hard, and after they are successful, they can experience the joy of helping others less fortunate. The first group of kids receive their supplies. There was not enough time to distribute to all the kids at this gathering. The boxes of supplies were distributed in their classrooms. Kids who received the supplies first show the contents to their curious onlookers. A hint of the crush upon our departure with kids incredibly eager for a handshake, high -five, or just a touch of the first foreigner they have ever seen. Aaron was a big target for those who wanted selfies. Classrooms were shoddy in this poor school, but not the smiles of the beautiful kids. Ms. Dzung, staff’s counterpart and close friend, asked if we could visit her daughter’s junior high school so students studying English could hear native English speakers. We started the day at Hong Bang’s English Speaking Club where 150 students participated. The meeting began began with a terrific student singing “This Girl Is on Fire”, the only song ever downloaded on my phone. Very Auspicious! After introductions, staff decided to speak about the good advice received in life: 1. Be the bigger person; 2. Have many teachers; 3. Keep changing; and 4. be honest. We engaged the children in discussing the meaning of each point. Aaron spoke about his job at Walt Disney, living in Hollywood, and some of the famous singers he has photographed. 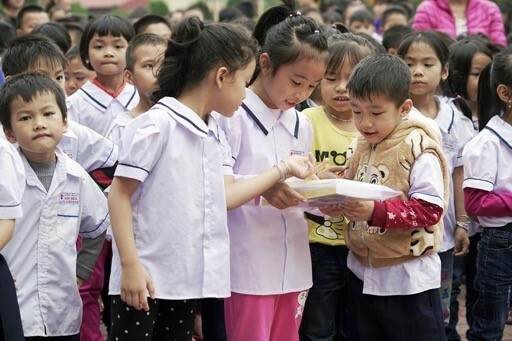 In the afternoon, we took children from Thanh Xuan orphanage to buy books, book bags and calculators, the final items that we had been requested to purchase by the five agencies we are helping. Amazingly, out of the chaos and excitement, we finally got our 24 book bags. Also, each student selected two personal books, and Ms. Dzung and I added many reference books and English dictionaries for Thanh Xuan’s library. For dinner, staff went to Cowboy Jack’s where the moto is “eat like an American.” Really! We did. In this restaurant, the Heinz ketchup flows like never before – on pizza, pasta, steak, ribs and everything else. 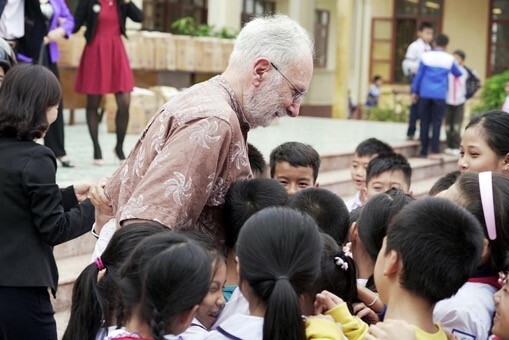 Tomorrow is our last day in Haiphong. We will go to HHCSC and see how the kids have learned to use the computers and take them to the bookstore. English Club students lined up to ask questions of me: what is the weather in America; what is the best university; what do I think of Uncle Ho? (This student just asked if she could shake my hand. I shook it and then said: “how about a hug?” Thus, the smiles. At the bookstore with pink backpack and selected books. At the Royal Tea Café doing special Vietnamese cheers: “Mot, Hai Bat ZO!” Ms. Dzung (far left), Ms. Ha (staff, third from left, and our driver, (standing). Some of the assistance, e.g. 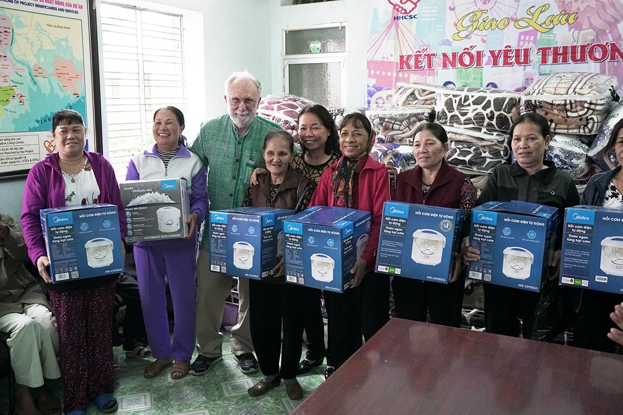 warm blankets, fans, rice cookers, improves the lives of impoverished old people. The enthusiasm of the recipients is perfectly clear. Similarly, the supply of mattresses and blankets to boarded students at the School for Visually Impaired Children who had previously been sleeping on cardboard covered wooden slats is clear. Kids are enthusiastic users of computers. They sit 2 or 3 at a time in front of each screen. Grandparents say their child wants to stay all day at HHCSC, in part because of access to computers. Children at Red Flower demonstrated several PowerPoint presentations they prepared using advanced features, and google searches. They also searched “Robert Miller,” not knowing how common this name is. In presenting their work, several adults have remarked on their apparent increasing self-confidence and relative ease in speaking to audiences. An English class has 15 attendees. When taken to the bookstore and told they can choose any books they want, most choose books to help their academic /developmental work. A large number bought dictionaries or books that teach English. One girl chose 3 relatively advanced math books. Two children wrote the author love letters in English using MS Word.